Many years ago, the Golf GTI was the daddy of the hot hatches. This fast German hatch was the one every boy racer dreamed of. 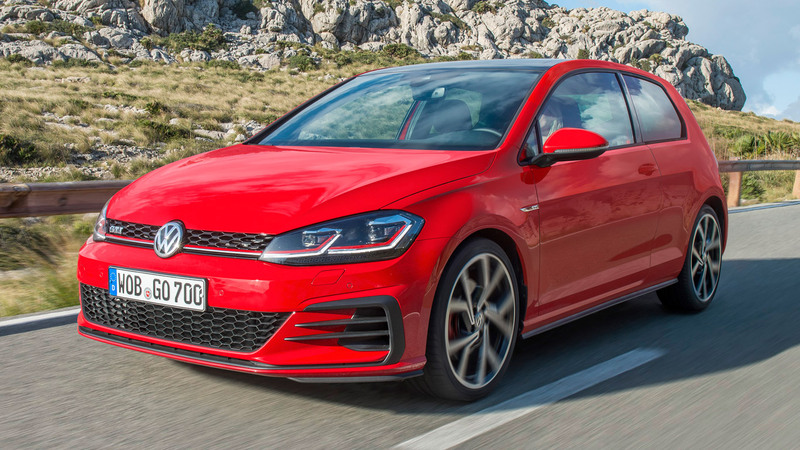 But today, in a market that includes the Ford Focus RS and Honda Civic Type R – not to mention extreme Golfs such as the Clubsport, Clubsport S and four-wheel-drive Golf R – the standard GTI seems a bit lacking. On paper, at least. Along with the rest of the Golf range, the GTI has been given the tiniest of facelifts for 2017. 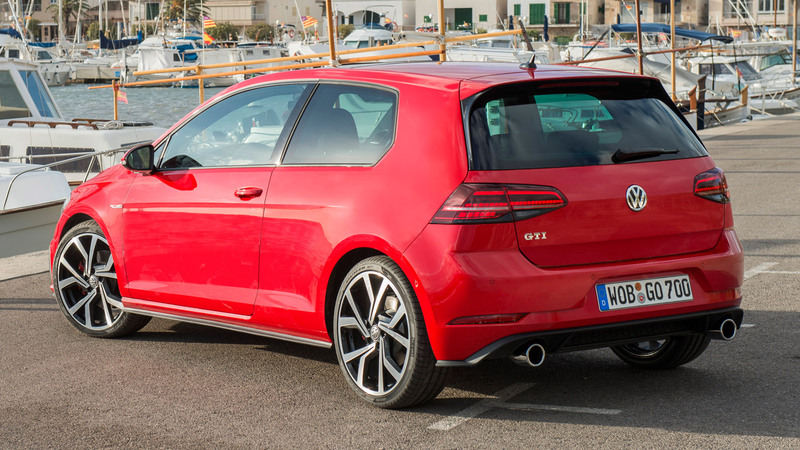 Spoiler alert: we think it’s enough to make the GTI one of the best hot hatches money can buy. Read on to discover why. Let’s start by looking at prices. 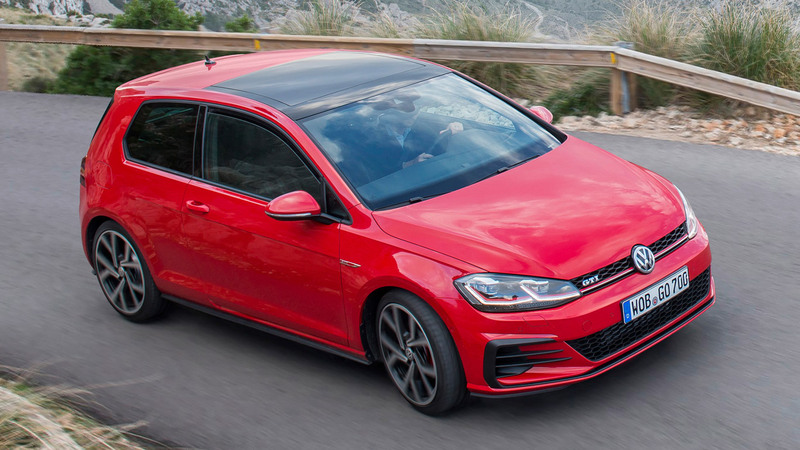 The Volkswagen Golf GTI manual, which we’ve driven here (and, incidentally, is the one we’d spend our own money on) starts at £27,865 for the three-door, rising to £28,520 for the five-door. That increases to £29,280 if you spec the grown-up DSG automatic gearbox, or £29,535 in five-door guise. But we wouldn’t. The Golf GTI is just lovely in standard, tartan seats and manual gearbox flavour. We overheard someone complaining on the launch that the interior could be more special – after all, you can’t see the tartan seats when you’re sat on them, and aside from a bit of red stitching, there’s not much to differentiate it from a regular Golf. But that’s missing the point. The cheapest fast Golf you can buy is arguably the best, because it harks back to what the Golf GTI has always been about. It’s a shopping car that’s been given a fun amount of power, without being over the top. Go on… why would you pick the manual? The six-speed manual ’box is lovely to use, with a short, precise throw. The pedals are perfectly positioned for giving the throttle a blip on downshifts, and it feels like one of the most authentic hot hatches you can buy. While the DSG gearbox is undoubtedly brilliant – not to mention faster than a clumsy human at changing gears – it does take some of the fun away. 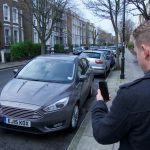 It’s good to drive then? Yeah. The progressive steering is wonderfully precise, reducing the number of turns needed to wind lock on and off. Feedback flows through, telling you when you can get away with adding more power. And despite lacking the four-wheel drive of the Golf R, you can feed the throttle through bends quite comfortably. The XDS electronic diff lock helps here, applying hydraulic pressure to the inside wheel to mimic the effect of a proper limited-slip diff. It works well. Sorry, we got this far without giving you the crucial stats. Power from the four-cylinder 2.0-litre petrol engine has been boosted by 10hp to 230hp, meaning it hits 62mph in 6.4 seconds. It’s marginally quicker than the outgoing model, but not enough to tell without driving them back-to-back. With the Golf R taking 4.9 seconds to complete the 0-62mph run in DSG guise, there’s still a big enough gap to avoid treading on its heels. If the boggo Golf GTI isn’t enough (it is) and you don’t want a Clubsport or an R, you can opt for the Performance Pack for an extra 15hp and an LSD. While we could take or leave the extra power, we’d be interested to see how a proper limited-slip diff tightens things up. Look closely at these pictures and Golf GTI nerds will be able to spot a few minor changes. For example, there are new 17- and 18-inch alloy wheels, as well as new front and rear bumpers and tweaked LED headlights. The fancy LED tail lights feature Audi-style dynamic indicators, too. They’re a bit flash, so to speak. Another feature that’s dripped down from sister-brand Audi is the Active Info Display (or Virtual Cockpit in Audi lingo). This replaces conventional dials with a 12.3-inch colour screen, incorporating digital dials, sat-nav directions and the like. It’s not as simple as Audi’s unit, unfortunately, and goes a bit against the ‘back to basics hatchback with a powerful engine’ ethos of the GTI. One of the major changes to the Golf GTI (along with all Golfs) is the £1,325 option of a 9.2-inch Discovery Navigation Pro infotainment system. In theory, it can be operated using a clever gesture control feature, allowing you to simply wave at the screen to operate menus. Maybe we need more time getting used to it, but after waving madly at the screen and not being able to do anything, we soon gave up and went back to simply enjoying the GTI. It’s a bit of a gimmick. What’s new elsewhere in the Golf range? The biggest change is the introduction of a 1.5-litre TSI petrol engine to replace the ageing 1.4 unit. The four-cylinder 1.5 is lovely, producing 150hp and hitting 62mph in 8.3 seconds. Despite the ‘Evo’ badge, it’s not particularly sporty, but it is fun. With combined fuel economy of more than 55mpg, it’s efficient enough to offer an alternative to diesel Golfs. 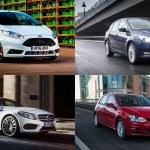 And, in the wake of Dieselgate, who’d want one of those? It’s pretty much business as usual for the Golf GTD. It’s fast, efficient and a bit GTI-like inside, but also a bit boring. If you’re a company car driver it makes lots of sense, but a diesel GTI it is not. Should I buy a Golf GTI, then? While the Ford Focus RS might offer more thrills for only moderately more cash we’ve fallen head over heels for the standard Golf GTI. On the empty roads of Majorca in February, we didn’t find ourselves wanting more power or the gimmicky features of the ludicrous fast Ford. The Golf GTI goes overlooked in a time when even a faster SEAT Leon is available, but it remains a brilliant buy. 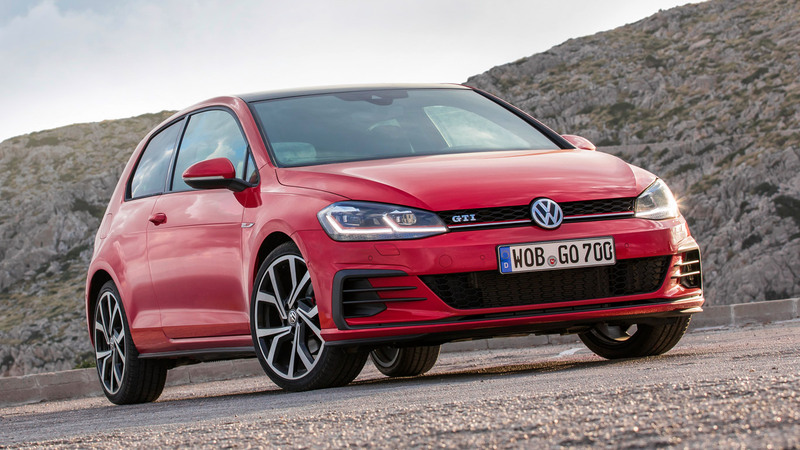 While the new features don’t bring a great deal to the table, they do make it more up-to-date, and the extra 10hp makes the GTI easier to justify over more powerful rivals. The prices are the same as before, with orders opening on 2 March 2017. Do it.